A very tasty and mouthwatering kuzhambu! 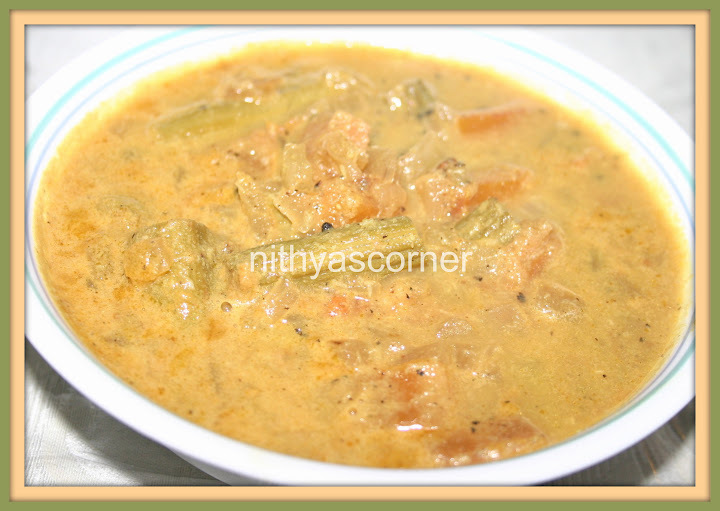 We can make poricha kuzhambu using a lot of vegetables. This recipe is made with drumsticks. I just love the drumsticks flavor in this kuzhambu. I make it often at home. My family just love this. When I have vegetarian guests at home, I do not hesitate to make this kuzhambu. My guests generally love this kuzhambu. I learned this recipe from Chef Dhamu. He has shared a mouthwatering recipe. Thank you Chef. You always rock! Curry Leaves – 5 to 8 nos. 1. Grind coconut and cumin seeds to a paste. 2. In a frying pan, heat oil. Add mustard seeds and when it pops out, add fenugreek seeds. When the seeds turn golden color, add curry leaves, onion and garlic. Fry until the onions turn transparent color, then add tomato. 3. Fry for 2 minutes then add drumstick pieces. Then, add tamarind water, turmeric powder, chilli powder, and coriander powder in an order. Stir well. 4. When drumstick has cooked, add coconut and cumin powder paste. Sim the fire. Add salt and stir well. Now, Murungakai Poricha Kuzhambu is ready! Serve. With Rice and Poriyal & Varuval, Curd Rice, Idly, and Dosa. This entry was posted in Kuzhambu With Coconut and tagged Drumstick, drumsticks, kuzhambu, mouthwatering recipe, Murungakai Poricha Kuzhambu on November 22, 2014 by vikashbhardwaz. Garlic (poondu) – 1 no. Cardamom (Elakka) – 1 no. Cinnamon (Lavangam) – 2 nos. 1. Grind the ingredients listed under ‘To Grind’ by adding little water. Heat oil in a pan and sauté onions until transparent. Add little salt. 2. Add curry leaves and chopped tomatoes. Fry until tomatoes turn mushy. Then add the ground masala and fry well till the raw smell of the ground masala goes off. It is very important for the raw smell of the garlic/ground masala to go off if not your kuzhambu flavor will not turn out good. 3. Once the raw smell of the ground masala goes off, add little water. Cook for 2 to 3 minutes and then add the chopped mushroom pieces. Cook for 4 minutes. 4. Add turmeric powder, chilli pwder and coriander powder. Fry for 3 to 4 minutes and then add little water. Keep cooking for 3 more minutes and then add chopped coriander leaves. Now, Mushroom Kuzhambu is ready!!! This entry was posted in Kuzhambu With Coconut and tagged coriander leaves, Curry Leaves, Mushroom pieces, Turmeric Powder on November 22, 2014 by vikashbhardwaz. Bittergourd (Pavakkai) is one of the recipes which I wanted to post since a long time. One of Nithyascorner’s member requested for it, and here I am finally with this post. Gj is a big fan of Pavakkai and he has to have it at least twice a week. I make Crispy Bitter Gourd Fries often and the fries have become my favorite family recipe. Both my in-laws as well as my parents do not make dishes with pavakkai often. My father does not like it at all because of its bitterness. When my in-laws or my parents visit us, we do not make this at home. Pavakkai Pitlai is very similar to Sambar. I have it with idly/dosa and rice. Pavakkai lovers or health conscious friends, do try this dish. I am sure you will love it. Pavakkai (Bittergourd) – 1/4 kg. Red Chillies – 4 to 6 nos. 1. Pressure cook 1/2 cup toor dal using 1.5 cups of water for 3 whistles. It will take about 10 minutes. Then wait for some time, release the pressure, and open the cooker lid. The toor dal should be mushy if not just mash it with a ladle. Remember, you will need 1 to 1.5 cups of cookedToor dal for the Pitlai. 2. Boil pavakkai using 2 cups of water, turmeric powder, and salt. Soak tamarind in water and extract its juice. Then add the tamarind juice to the pavakkai and boil well. 3. Meantime, heat oil in a pan. Add coriander seeds and fry till it sizzles. Add Gram dal (Channa Dal) and fry till golden brown. Add red chillies, peppercorns, coconut and fry for two minutes. Let them cool down. Then grind them using little water. 4. Now add Toor dal (1 to 1.5 cups of cooked Toor dal ) and mix well. Then add the ground paste and jaggery. Cook for five more minutes. In a separate pan, heat oil and let the mustard seeds splutter. Then add Urad Dal, curry leaves, and asafoetida and fry till Urad Dal turns golden brown. Now add the seasoning to the pitlai. Give a quick stir. Now Pavakkai Pitlai is ready! 1. You can substitute coconut oil with any other oil. 2. You can also add 2 tablespoon of coconut milk at the time of adding jaggery. This entry was posted in Kuzhambu With Coconut and tagged Bittergourd, Channa Dal, Coriander seeds, Pavakkai Pitlai, Urad Dal on November 22, 2014 by vikashbhardwaz.